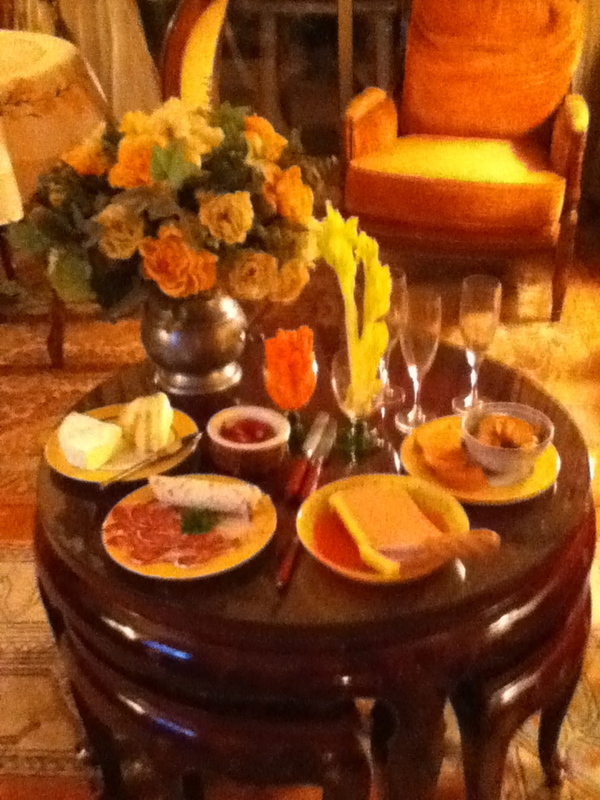 The hors d’oeuvres without recipes. Okay. I have a new oven and I don’t know how it works because it’s FRENCH. Not only that but I had NO stuffing for my usual standby appetizer of stuffed mushrooms so I found QUINOA and thought that might do. It did, but I added some lentils to beef it up a bit……then I added cheese (goat cheese and brie in teeny little peices on top with some finely minced parsley. Then I set it in the oven for about 10 minutes – I have no idea what temperature -I just winged it – temps in French are not temps where I’m from. I just timed it with my iPod and watched it. Also, I had sauted the mushrooms beforehand in some butter and a bit of olive oilso that they would have better flavor. They did. Then I set out duck pate, noix cheese with Kirsch, Brie, and some thinly sliced sausages along with some kind of crispy bread from the market, small toasts, and some freshly cut french baguette that David just brought home. PERFECT! Then I had some carefully cut sized carrots sliced just so (from my culinary class instruction) and celery and radishes in small bowls out as well. There was a beautiful baguette out for a nice effeect. Did I say I had sausage/ yes. And did I say this was for our first guest in the new digs and to share the CHAMPAGNE with him which was left by the owners of the apartment?? Wasn’t that just so incredibly nice? They did not have to do this – nor leave the BRAND NEW KNIFE in the drawer because they know I love to CHOP (veggies)!! And because we are so grateful to this wonderful French man in the apartment next door for helping us with the last 2 apartments?!? He is a saint!!! We love you Maurice! This is short because I need to go to bed!! It’s December 1st. We have been here 2 months!